What is death? Why do we die? and what happens after we die? Over the centuries, philosophers and theologians of the world's religions have offered answers to the dilemma of death, yet this subject is rarely given the detailed attention it deserves in the contemporary Christian church. As Christians, how does our view of death impact the communication of the gospel in today's pluralistic societies? In this study, Dr Bobby Bose not only develops a solid biblical theology of death, he also reviews the teachings of contemporary and historical Christian theologians around the world, and examines the "state-after-death" beliefs of Hindus, Muslims and Secular Humanists. The author shows that "state-after- death" was a central component of conversation in the early church, and is also a major component of God's mission to rescue humanity. As the East converges with the West, it is vital that Christians develop a missiological approach to "state-after-death" that will encourage positive engagement with people of other faiths and beliefs. 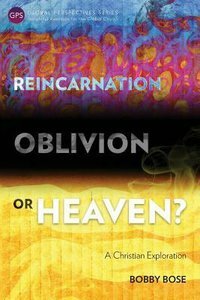 About "Reincarnation, Oblivion Or Heaven? : A Christian Exploration (Global Perspectives Series)"